Well if you think they look funny for newlyweds, don't be surprised... They are not really newlyweds, but actors - and they are not even just married if I understood the plot of their play correctly, they are just on the verge of getting married and scared to death! 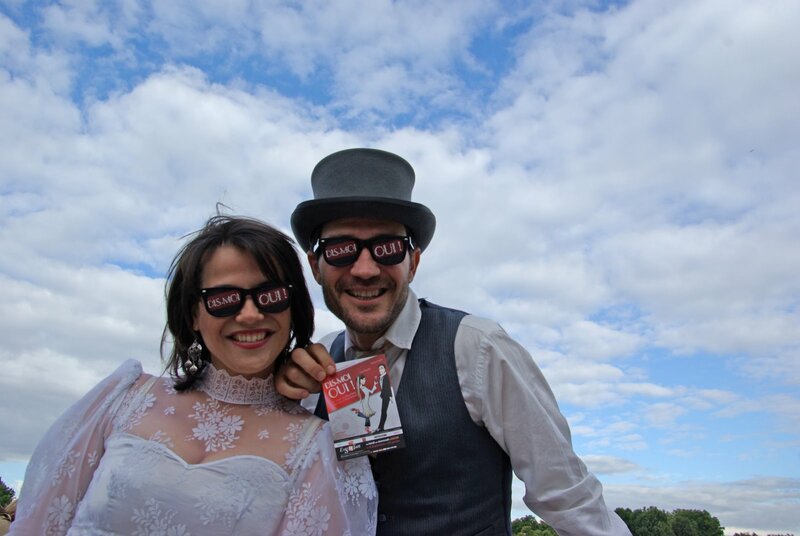 Anyway, I found them (Elsa Pasquier and Matheo Capelli) on the Seine banks today, promoting their play Dis-moi oui!, among dozens of other show people at "Spectaculaire", an exhibit dedicated to the upcoming shows in Paris this year. Clever idea. Bringing the actors out on the streets as advertising for their shows is a great idea. It looks like your weather is nice. Oui! they do look like they are having a great time promoting. What a cute couple regardless. ;-) You really captured their zest for life and the theatre. I just came back home from the "Van Gogh, Gauguin, Cézanne and Beyond" show at the San Francisco DeYoung Art Museum. These artworks are on loan from The Musée d'Orsay while she is getting a face-lift. LOL The show was really crowded. San Francisco really loves art and especially art from France. Clever indeed! And how great of you to go, photograph, interview—and share with us. Merci, Eric! they make a cute couple anyway! No Jeff, the weather is like your summer right now - cooooold! And Eric, can we expect the same sort of photo when Guille and Michael's (<-she has good taste doesn't she!) wedding day is here? I have seen "for real newlyweds" looking stranger than this cute couple. It's a great promotion idea to let the actors meet the crowd in the streets instead of just putting up posters. I would love to see their show. Guille are you getting married some time soon ??? Wow! This is the biggest "OUI" in life. Do I say it in French or in English? I hope I don't piss Shakespeare off if I say "Yes". Sure that must be the biggest yes in life. Well I would live it as because I would only say this big yes if I was really aware of what it really means at that moment. Blue skies and "newlyweds", what could be better? Fun capture, Eric. Love the 'Dis mois oui' on their sunglasses.